New Revenue Alerts: When the first invoice is created for a customer. Invalid Payment Methods: Whenever the customer's payment method becomes invalid. Fraud Monitoring: Whenever a suspicious transaction is detected. Please do note that this supported only in Stripe. Daily Digest Mails: Mails regarding sign up, transaction summary etc. 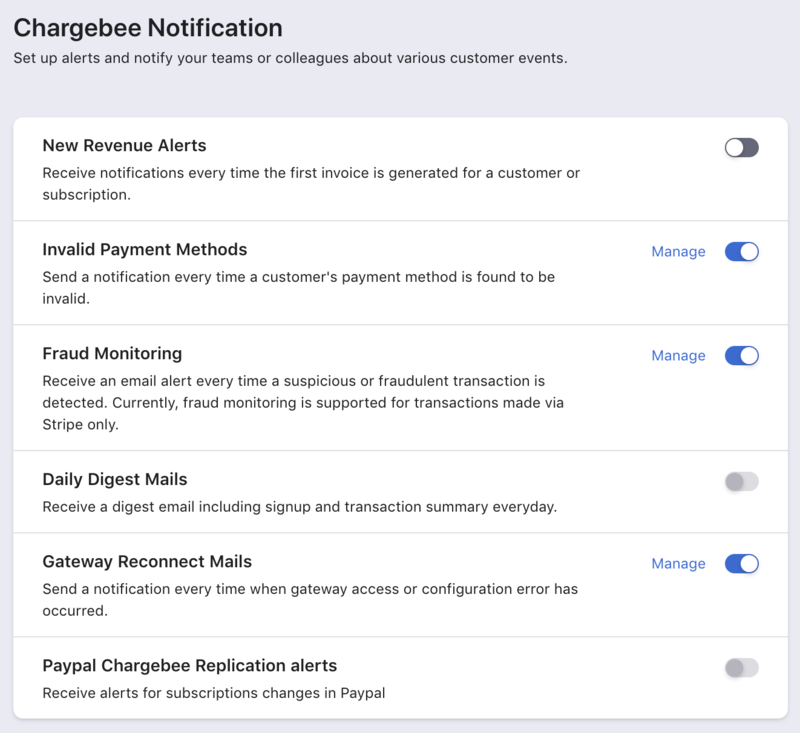 You can set up Chargebee notifications in 4 easy steps. Step 2: Enable the notification that you wish to configure. Step 3: Select the recipients. You can also configure notifications to be sent to people who do not have access to Chargebee. Enter the email address of the people you want to notify in the Others Chargebee users and people in your organization section. Step 4: Click Apply Changes. You can change the settings any time by clicking the Manage link next to the notification.